If it seems as if the Maldives contain enough tourist villas to make up an entire city full of transients, that’s because they do. Tourism is the island nation’s largest industry; most of the permanent residents live on the capital island of Male. 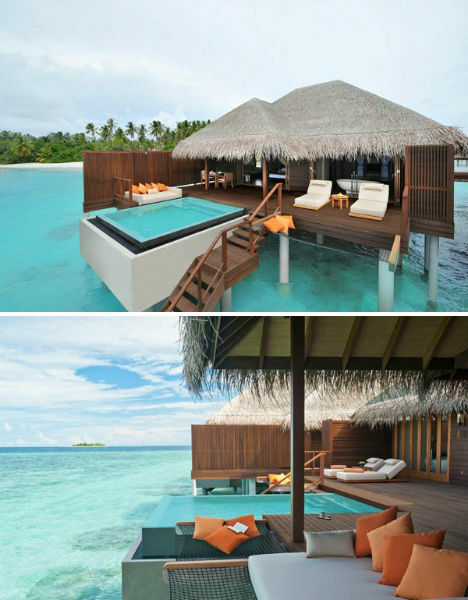 Over 85 islands have been developed as tourist resorts, with a total capacity of about 16,000 beds. 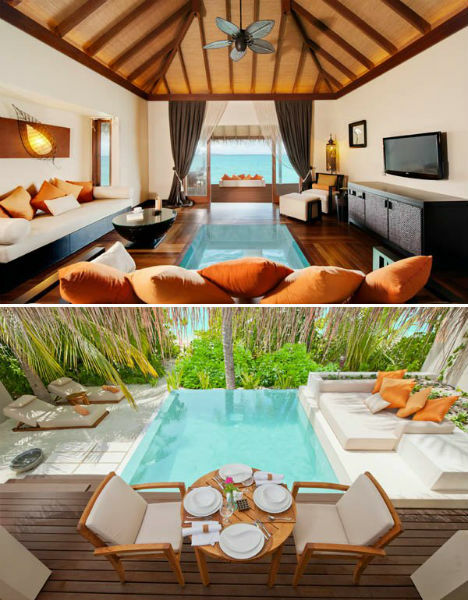 Soneva Gili is one of those resorts, with 45 over-water villas and a Private Reserve reachable only by boat. 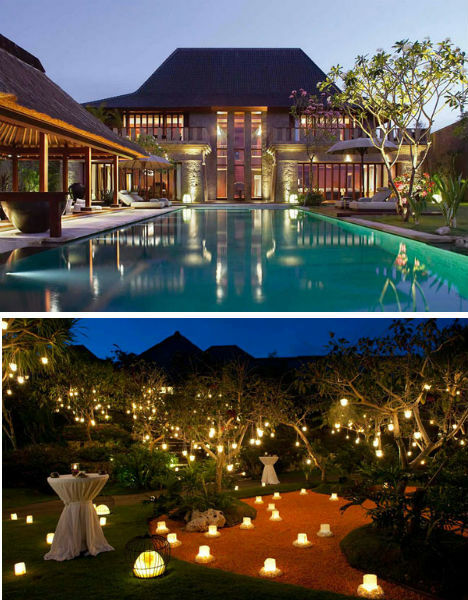 Traditional Balinese architecture merges with modern and Italian elements to form the unique Bulgari Resort. 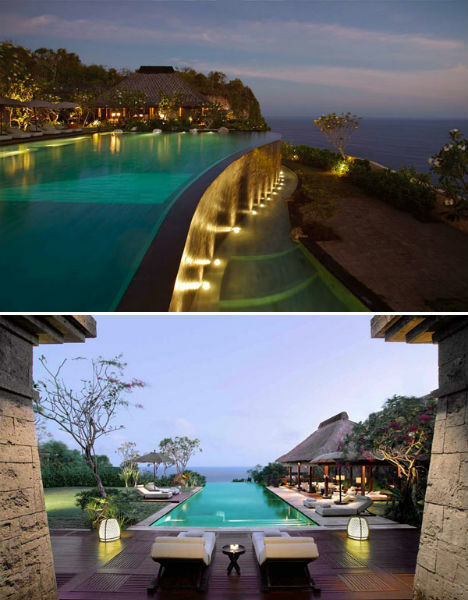 This Bali getaway in the Indian Ocean extends 150 meters (492 feet) out over the sea. Each stone on the site has been cut and chiseled by hand according to local tradition, and many of the resort’s structures bear intricate relief carvings in wood. 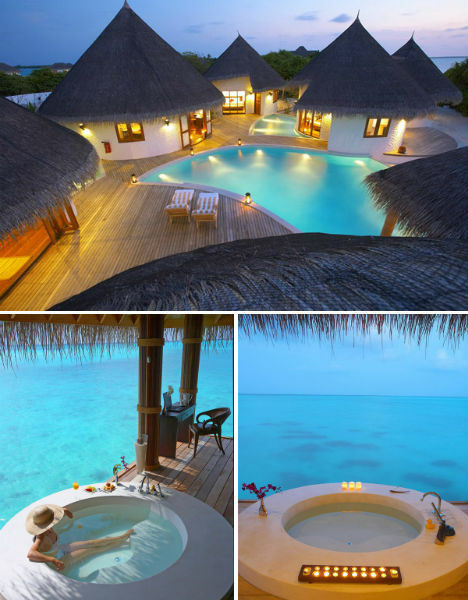 Relax by the pool among thatch-roofed huts at Island Hideaway, another Maldives resort on the crescent-shaped island of Dhonakulhi. 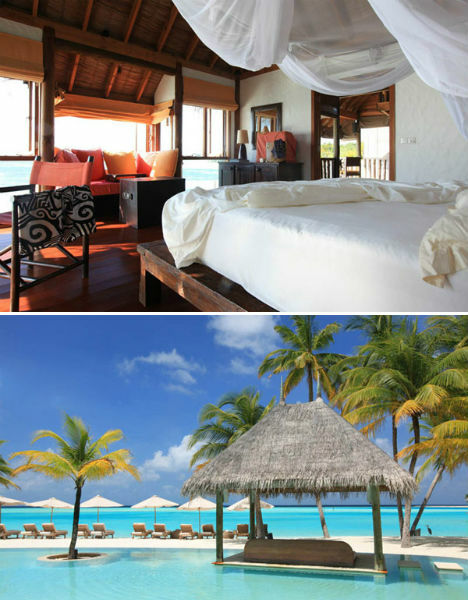 Guests choose from 8 types of villas starting at about $800 per night, including poolside, garden, water suites and family villas. Look through the glass floor of your private paradise hut straight into the beautiful blue waters below at the Ayada Maldives Resort. Ocean views, lush tropical greenery, impeccable white sand beaches, infinity pools and hammocks that hang right over the water make this island getaway seem like heaven on earth. 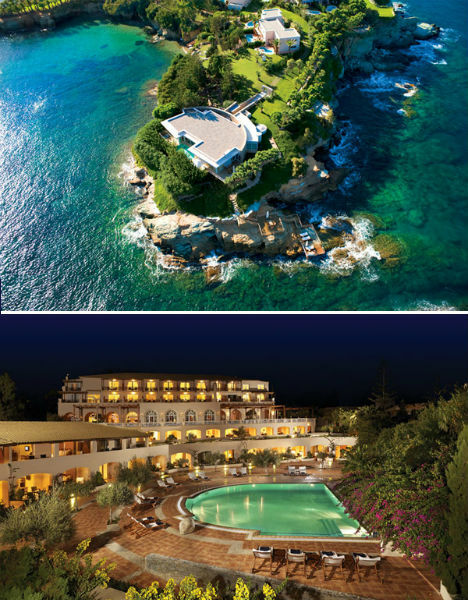 On a private peninsula in Crete you’ll find the Out of the Blue Capsis Elite Resort, a five-star luxury retreat with two main buildings and three private ‘neighborhoods’ full of guest rooms, suites, bungalows, villas and ‘maisonettes’, depending on your desire for space and privacy. If you’re after more than just swimming in the picturesque Aegean Sea, the resort is also close to cultural attractions and historical sites. 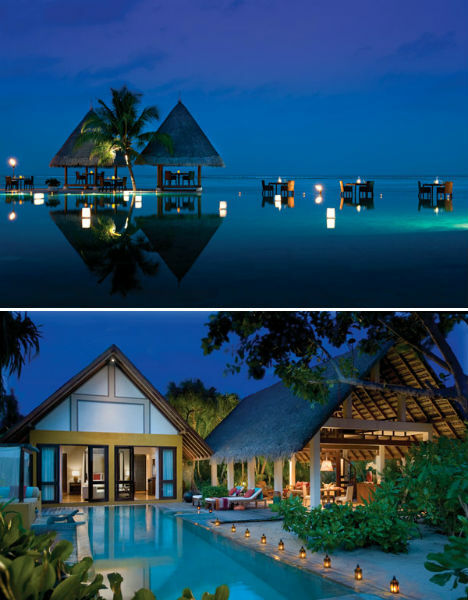 Water is definitely the defining feature of the Four Seasons Resort Maldives, where all of the villas, lounges, pools and dining areas appear to float. Located on two remote coral islands, the resort features exotic architecture and decor, a stone pavilion that slants down into the sea, and lush gardens. 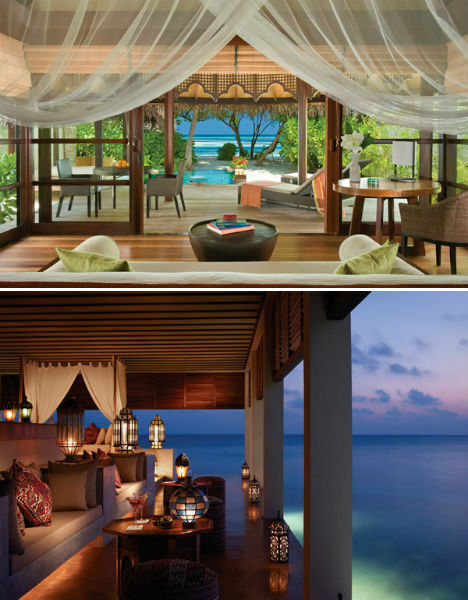 With 98 beach villas tucked among tropical greenery for privacy and 32 ocean villas set right above the water, One&Only Reethi Rah resort offers yet another dream vacation in the Maldives. 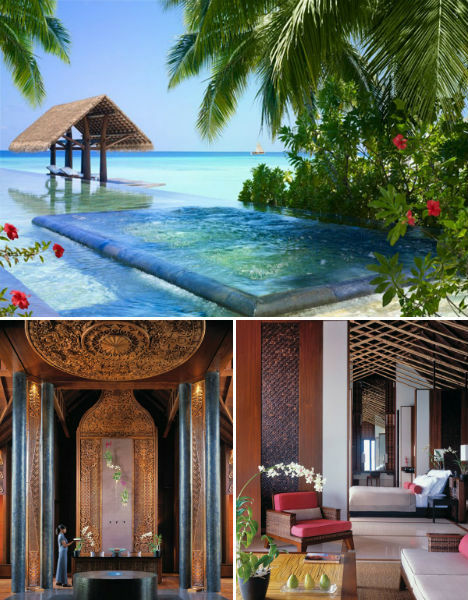 In addition to all of that breathtaking natural scenery, Reethi Rah features beautiful architectural and design details to stimulate the senses.